Apple recipes are known to be popular during the crisp fall months. 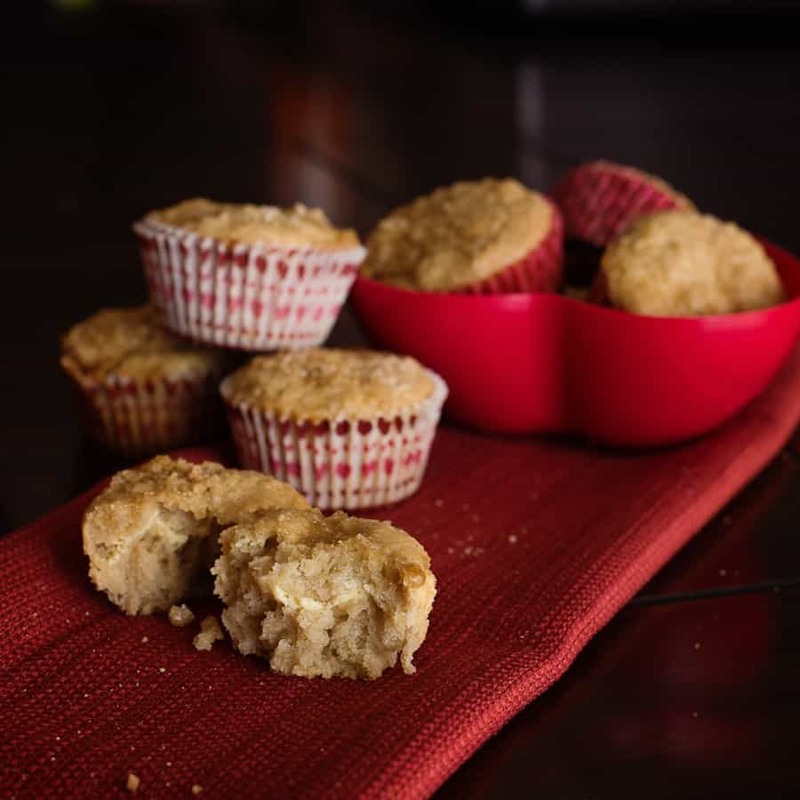 But there is one apple recipe that we love to make all year round, Apple Cream Cheese Muffins. They are soft, moist and melt in your mouth with a crunchy streusel topping. We like to make muffins and store them in the fridge for quick, easy and homemade breakfast treats. These Apple Cream Cheese Muffins are made with real fruit and make you feel a little better about eating them. Apples are better for you than chocolate chips, right? These are just 3 points per muffin. In our recipe, we used shredded apple pieces and did this pretty quickly with a food processor. If you like a little apple crunch, the apples could be diced up instead. There are lots of variations that you could try with this Apple Cream Cheese Muffin recipe. I invite you to give this recipe a try and let us know how you like them in the comments below! Filling – Mix together in a small bowl and set aside – cream cheese, 2 tbsp of brown sugar and 2 tbsp of the beaten egg. Mix together the remaining brown sugar, flour, cinnamon, salt and baking powder until well blended. Add in the vegetable oil, applesauce, vanilla and remaining egg. Mix all together. Mix in the shredded or diced apple with a spoon. Fill muffin cups about half full (makes about 15 cups), top each muffin with the cream cheese mixture and then spoon the remaining batter to fill each muffin cup about 2/3 full. Mix together the streusel ingredients and sprinkle over the batter. These muffins are 3 Weight Watchers Points each. Bake for about 25 minutes, or until toothpick comes out clean. Cool and then remove from pan. What size muffin pans do you use? Regular size or the mini muffin size? regular. you could do mini but i would adjust your baking time! It’s 3 points a muffin, Scott 🙂 I’ve lightened it up since I inherited the recipe from a friend! Apples and cream cheese are such a delicious combo! These look really yummy. They sound much better than the recipes I used on ww. These look too good! Thanks for sharing! Oh wow these look super delicious. I love apple muffins, the cream cheese is a bonus. We will definitely give this recipe a try. Love the chunks of apple. What a simple apple recipe! I would love these! I know it’s not quite the same as eating fresh apples, but since I’m allergic to apples when they are not cooked, I look for every opportunity to eat apple in breads and desserts. These look incredible! I think I am going to make these and store them for quick breakfast bites for the children. These look amazing. I pinned them to my board to make sure I get around to making these. 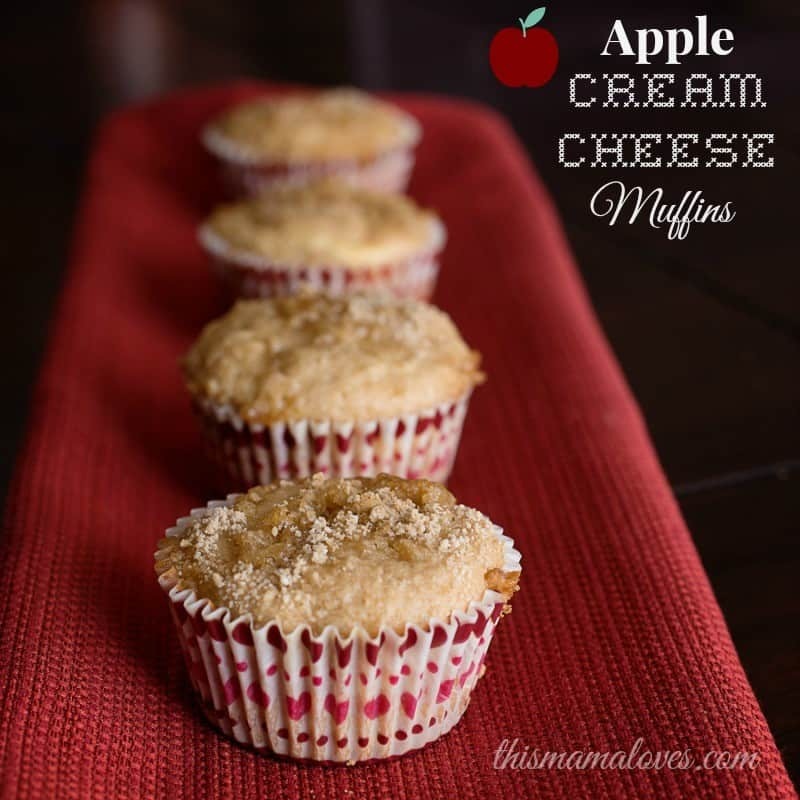 I love apples and cream cheese, so I will like these muffins for sure! I adore apples…and cream cheese. I just know I would love these! This looks like a really tasty dessert! I would love to adapt it to a gluten free version! This is a winning combination! I bet these are super moist. Those look delicious. Thanks for sharing your recipe. I love pastries with apple in them, I would definitely make this with the apple chunks. Thank you for sharing this recipe.